Both a history of fine jewelry coming out of Paris in the Golden Age and a tour through the secretive world of high-end, privately-sold jewelry, Diving for Starfish is a stylish detective story with a glittering piece of jewelry at its heart. In the mid 1930s, in the workroom of the famous Parisian jeweler Boivin, a young jewelry designer named Juliette Moutard created one of the most coveted pieces of jewelry in the world—the famous starfish pin—still sought after today by aficionados of fine jewelry. The starfish, created out of gold and encrusted with 71 cabochon rubies and 241 small amethysts, was distinctive because its five rays were articulated, meaning that they could curl and conform to the bustline or shoulder of the women who wore it. The House of Boivin made three of them. Two of the women who bought and wore the starfish were Claudette Colbert and Millicent Rogers. Obsessed with the pin after she saw it in the private showroom of a Manhattan jewelry merchant, Cherie Burns set off on a journey to find out all she could about the elusive pins and the women who owned them. Her search took her around the world to Paris, London, New York, and Hollywood. 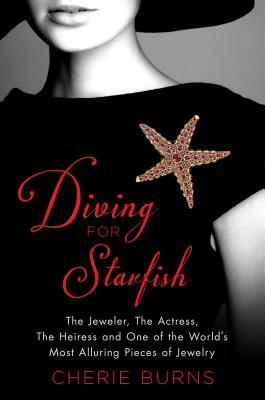 Diving for Starfish is the story of these marvelous pieces of jewelry and the equally dazzling women who loved them. CHERIE BURNS is the author of Searching for Beauty, The Great Hurricane: 1938, and Stepmotherhood. Her work has appeared in The Wall Street Journal, The New York Times Magazine, People, and Glamour, among others. She lives in Taos, New Mexico. "Cherie Burns delves deeply into the sea of mystery that is the period jewelry industry. What she found is captivating and wholly satisfying. The 1930s and 40s Boivin starfish are the quintessential ornament--the most complete example of the jeweler’s art. Pins and brooches do not require much to work their magic, just an audience of one is enough. These come with a fascinating narrative, patiently researched and well told by the author. The legend of these famous starfish is part of their elusive allure, as are the people whose path became part of their history. The Boivin starfish are like waves: they wash up on the shoulder of only a special few, display their rare, captivating beauty and then fall below the surface once more. As Cherie Burns explains, we never know if these glorious bits of bejeweled flotsam will ever see the light of day again." "Cherie Burns is a dogged investigative reporter on the trail of the mythical Boivin starfish brooches once owned by the likes of Claudette Colbert, Millicent Rogers and São Schlumberger. Along the way, she takes us on a magical mystery tour through the world of high-end jewelry dealers and jewelry makers from New York and Paris to London, Hollywood and Miami, introducing us to dozens of intriguing characters who cater to the tastes and whims of the superwealthy. A fascinating tale told with verve and passion."